Good morning, my Cutting Edge Stencils friends! A front porch can be a favorite spot to kick back and relax. A simple solution to giving your concrete porch a more decorative look is to paint and stencil it. 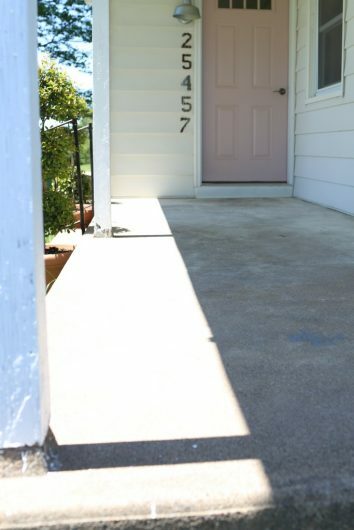 In fact, an allover stencil can easily give a tired porch a fresh new look. 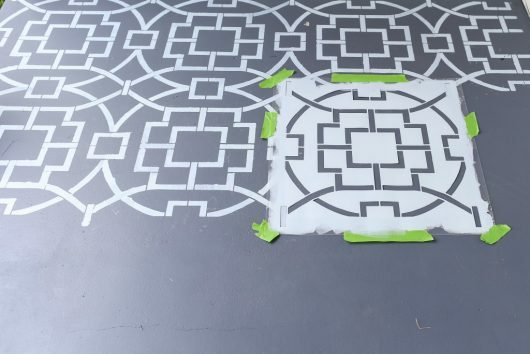 Let’s take a look at a concrete patio overhaul featuring our Tea House Trellis Allover Stencil that will hopefully inspire you to tackle your very own porch project in the near future. Lackluster but full of potential! Becky loves both a vintage look and bold patterned tiles. She wanted her outdoor space to stay true to her decorating style. So the first thing she did was paint the porch using Valspar Latex Porch & Floor Paint in gray. You can catch the painting tutorial on her blog but today we’re going to focus on the next step, stenciling! Remember how we told you Becky loves bold patterned tiles? 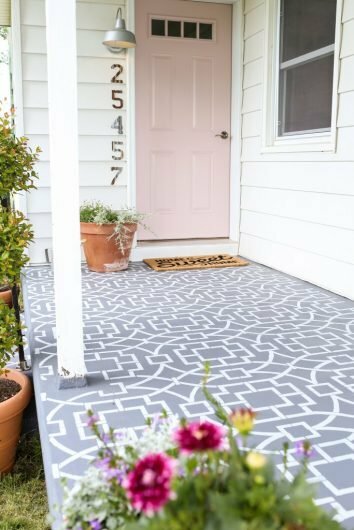 Well she said, “I wanted to use these awesome patterns in my front porch update, but I just wasn’t sure I wanted to tile the space.” Stenciling is a great alternative. It’s easy and affordable to add a bold floor or wall pattern using stencils. 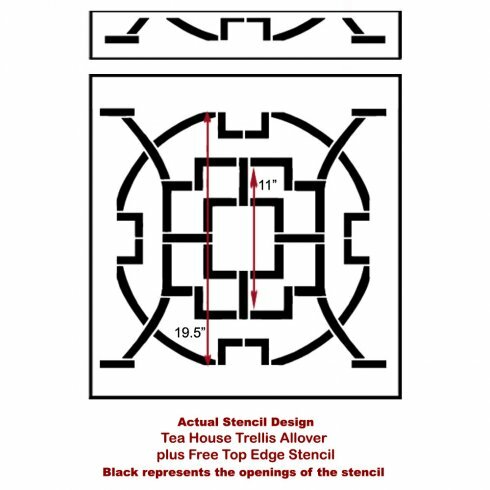 Becky browsed our large collection of geometric stencils and fell in love with the Tea House Trellis Allover Stencil. This oversized trellis pattern has an undeniable Eastern influence and is perfect for stenciling on floors and walls. She painted the pretty allover stencil in white over the soothing gray hue. She used blue painters tape to hold the stencil in place on the floor. Then she poured her paint into a small tray and painted with a dense foam roller. Once the stencil was complete, Becky added some pretty potted plants for a welcoming touch. She’s still waiting for her outdoor couch to arrive and plans to complete two more DIY projects before she calls this project finished. Are you ready to see how Becky’s stencil work turned out? Here it is! 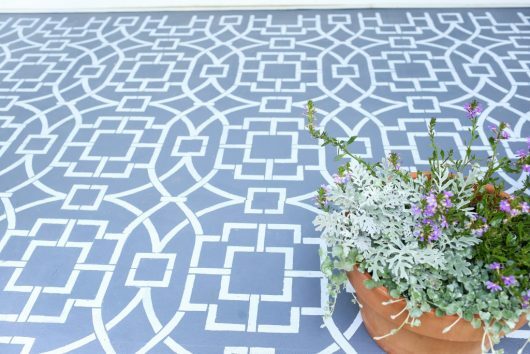 We think this trellis stencil looks gorgeous! Here is a close up of the eye-catching design. 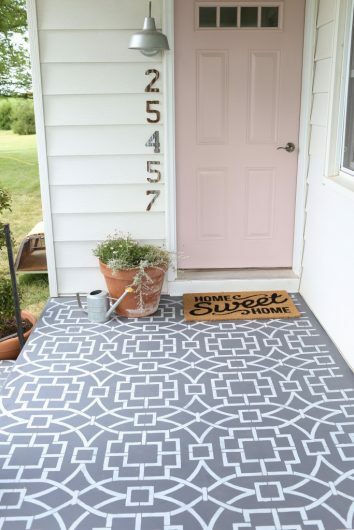 Tell us, would you consider stenciling your porch? Leave us your thoughts in the comments below! Shop our wall stencils and add style to your DIY decorating project!